In paratesticular liposarcomas, the most common histologic subtype is well-differentiated liposarcoma which has lipoma-like appearance. Most cases show varying degrees of sclerosis consisting of fibrous bands traversing the tumor (as seen here). The sclerotic areas may contain spindle cells with hyperchromatic, irregular, enlarged nuclei. 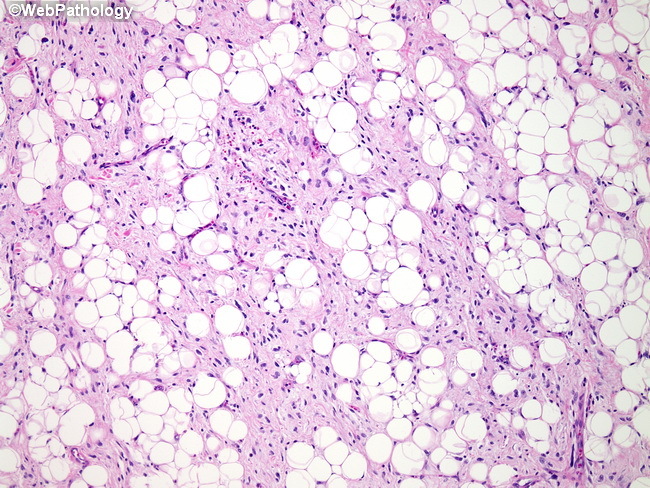 The presence of these atypical cells in the fat or within the fibrous septa helps in distinguishing them from lipoma.